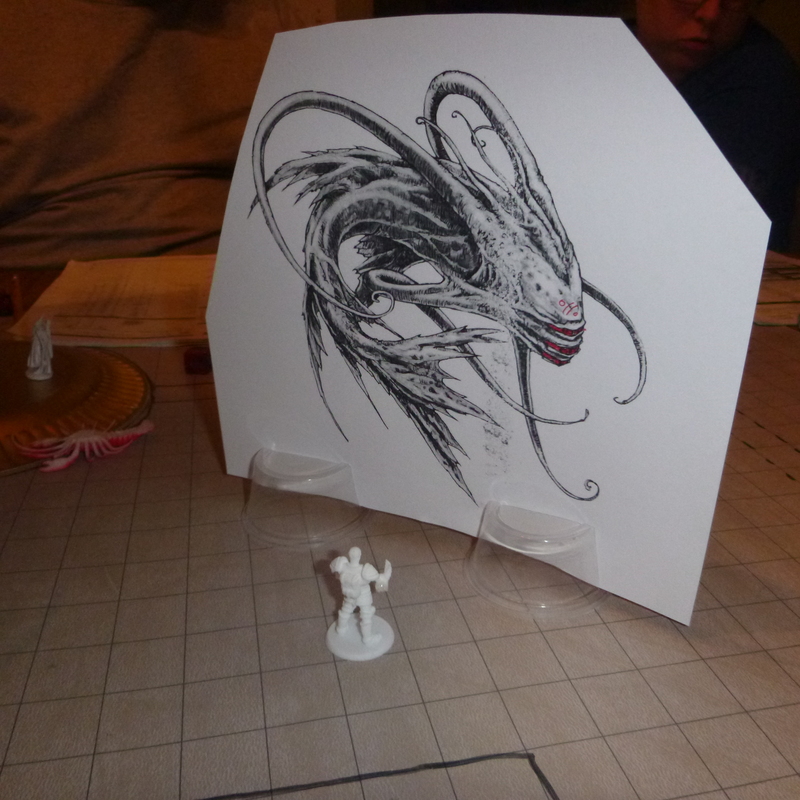 My players have learned to dread the Aboleth more than any other classic Dungeons and Dragons monster. Dominate Monster is always a frightening ability to face but I think it’s the Aboleth’s alien intelligence and ability to transform a character with slime that makes the monster so unnerving. 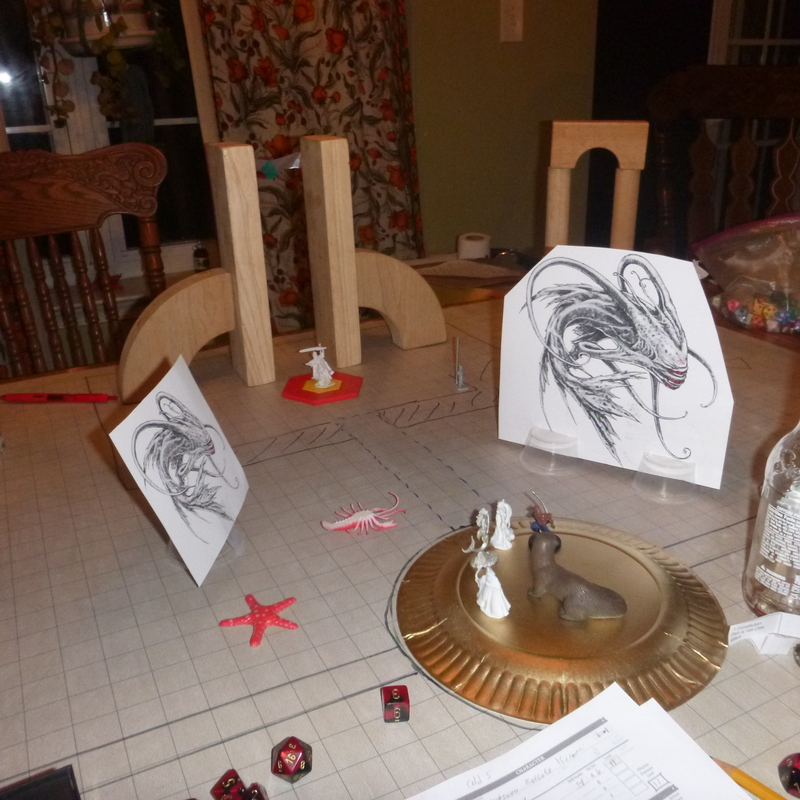 My players have faced Aboleth a few times throughout my Broken Covenant campaign and I wanted to take it up a level when we reached the climax of that story arch. So I put together a Mythic Aboleth and then powered up it’s slime. Undergo one of the following transformations. Remove disease can remove 1-5 transformations when used. You gain a random energy resistance 5. After 2 transformations, each time you speak a sentence you must randomly include one of the following words “Narton”, “Kyl’khel”, “Dra’si”, “Ul’eff”, “Rys”, “Myk”, “San”, “Kyr”, “Ill’kluh”, “Isreaka”, “Nyr”, or “Shaka”. This is a subconscious tick similar to that experienced by individuals with Tourettes Syndrome. This results in a 5% chance of spell failure when casting spells with vocal components. This penalty increases to 10% after 4 transformations and is negated at 6 transformations. After 4 transformations, your mindset shifts drastically leaving you confused. Roll a Will Save against DC 20. If failed you are subjected to a confusion effect for 1d4 rounds. Each round you must roll a percentage die to determine how you act. After 6 Transformations, your type changes to Aberration. Transformations can no longer be removed via Remove Disease. True Form, Restoration, or higher are required to restore you. You lose the ability to speak normally and can only voice the phrases that the aberrations do, but if restored your mindset returns to normal. Now that you have fully transformed speaking in this way no longer negatively impacts your spellcasting – i.e. you no longer have a chance of spell failure when casting spells with vocal components. You are no longer hostile towards any aberrations and they are no longer hostile towards you. You retain your previous affiliations with other creatures but interact with them in a bizarre, alien manner. You do not independently attempt to restore your original form but it is up to you if you resist efforts by your allies to restore you. “Abberations are people!” declared one player as the mutations piled on and the player characters started to speak in metaphors*. This is only partially true in this campaign – some of the abberations have been people transformed by this particular Aboleth. This included one NPC who was very important to a guildmaster but, fortunately, a player character made the decision not to kill that Abberation in an earlier sitting. *Abberations in this campaign speak in metaphors, sharing the secret lore of the world in a way that no one understands… I was, of course, inspired by the Star Trek: The Next Generation epsiode Darmok.